When we first bought our iRobot Roomba Vacuum 2 years ago, we had high hopes that it would change our lives for the better. No more vacuuming, no more sweeping, total bliss! Well let me tell you, were have not been disappointed. Rosy the Roomba, as we call her (named after the robot made in the Jetsons) has never let us down. On the contrary, today she exceeded even our wildest expectations. Rosy has been cleaning our house since before Luke was born, and up until this point, he has always ignored her. However, suddenly today when she was humming merrily about the house, Luke took notice. He was standing in his walker, transfixed, totally staring at Rosy for at least 10 minutes. A while later when he was on the floor playing in another room, Luke actually crawled down the hall and started following Rosy around the family room. He spent a good long while happily chasing her throughout the house. 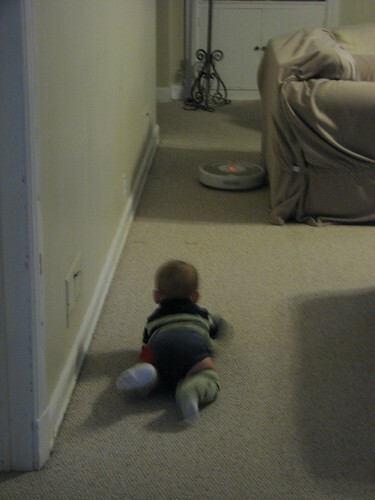 Yes, ladies and gentlemen, we have the first ever Robot Babysitter. I honestly can't remember much from the Jetsons, but I do believe that today Rosy the Roomba took on new qualities of her namesake. Who knows, maybe she'll be doing our laundry next?